These chairs are the perfect compliment to our poker tables. These swivel/rock chairs work well with the 2-in-1 and 3-in1 poker tables. Shown in both the Standard and Wilderness versions, the basic chairs are produced with vinyl upholstery. Leather or cowhide are available for an additional charge. 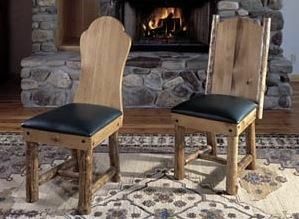 In order to provide more seating around our game tables, we offer these two side chair styles (third). 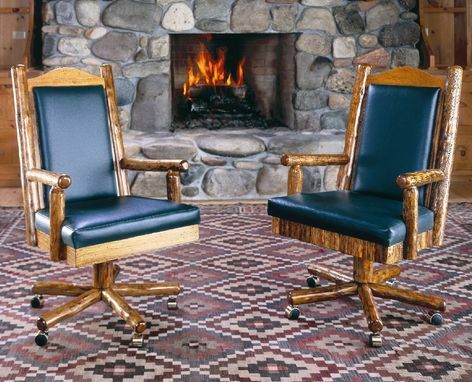 The keyhole style (left) is the smaller of the two for maximum seating, while the log trim side chair (right) complements our tables with a tall back style. Both have upholstered seats which can be covered in a choice of colors. Both side chairs are shown in the Standard version with basic vinyl seats.